Confectionery may require reclamation or reworking for a number of reasons, for example when high speed production lines stop because of a problem downstream, such as a fault in coating machines or a breakdown in the packing line. Another cause of waste product is when sweets are rejected as being mis-shapen or otherwise out of specification. Ingredients produced on a continuous basis are often diverted into scrap bins until the line is running again, as stopping production may be difficult and costly. The reclamation of confectionery waste can be difficult, which in the past has resulted in product simply being scrapped. However, the high cost of raw materials such as sugar and cocoa means that it is increasingly important to try to reclaim and rework “off-spec” product. Individual gums and boiled sweets can be added to hot water and agitated until they gradually dissolve to result in a uniform mixture. Agglomerated masses or large solids would first require grinding or chipping to smaller pieces before being processed in a similar manner. Hard, friable solids and insoluble ingredients may need milling or grinding to a manageable particle size. Often a closed vessel is required, as the operating temperature required to melt or dissolve the solids can lead to loss of volatile ingredients, particularly flavourings, through evaporation. If even small amounts of water are introduced into molten chocolate it can “set” immediately. Chocolate also tends to work harden. Temperature must be carefully controlled to prevent burning or caramelisation of the product. Long mixing times are required to completely solubilise the waste and obtain a uniform and usable product. Large lumps and agglomerates in the mix can cause serious damage to the agitator. Incomplete solubilisation can lead to unsatisfactory product consistency. Holding the product at raised temperatures for long periods can impair the flavour and quality. The structure of gelatine based confectionery breaks down at temperatures above 70ºC (160ºF), requiring the addition of more gelatine after reworking to regain the gelled structure. Silverson has developed a complete new system specifically for the reclamation of larger solids and agglomerated confectionery. The system consists of a jacketed vessel, fitted with a High Shear Bottom Entry mixer and an In-Line mixer in a recirculation system. The unit is skid mounted and has an integral control panel. Operation is described below. Small solids can be reclaimed using the Silverson Duplex Disintegrator/Dissolver unit. In a typical operating procedure the vessel is first charged with the base fluid, most commonly water. This is heated to the required working temperature before the bottom entry mixer is started and the product for reclaim is added. Large solids can be added without the need for pre-grinding. The mixer exerts a powerful suction which draws the materials down into the workhead, where they are rapidly reduced to granular size. When particle size is sufficiently reduced the In-Line mixer can be started. The materials are drawn into the recirculation line and pass through the In-Line mixer’s workhead which subjects the materials to intense high shear. The self-pumping unit then returns the product to the vessel as fresh ingredients are simultaneously drawn in. The combination of heat, vigorous agitation and intense high shear accelerates the solubilisation process and quickly reduces the entire contents of the vessel to a homogeneous mixture without appreciable deterioration in product quality or flavour. The In-Line mixer can also be used to transfer the processed rework back to the production line, in some cases without the aid of a positive pump. When processing chocolate confectionery, one of the constituents of the end product such as cocoa butter, or even a proportion of the original product is first added to the vessel to provide sufficient liquid to cover the workhead. Where solid chocolate is added to the vessel, an integral scraper unit can be fitted to provide gentle agitation and uniform heating of the product until molten. To speed up this part of the process the bottom entry mixer can also be run to disintegrate large solids once the liquid level covers to workhead. Improved product uniformity and consistency. The vigorous in-tank movement provided by the Bottom Entry unit can eliminate the need for scraped surface agitation in the vessel. Can be custom-built to suit individual process requirements. CIP spray balls can be incorporated into vessel design. Jacketing on the vessel and (where required) the In-Line mixer can be used for temperature control to stop product being damaged by overheating, or setting on cooling, for instance where gelatine based confectionery is being processed. Different levels of automation, instrumentation can be incorporated at the design stage. The unit can also be linked to ancillary equipment or process computers if required. For processing smaller solids, the Duplex Disintegrator/Dissolver can be used in place of conventional in-tank agitation. The Duplex has twin workheads, facing in opposite directions. The upper workhead pulls materials down from the surface of the mix and subjects them to an initial disintegration before expelling them radially back into the mix. 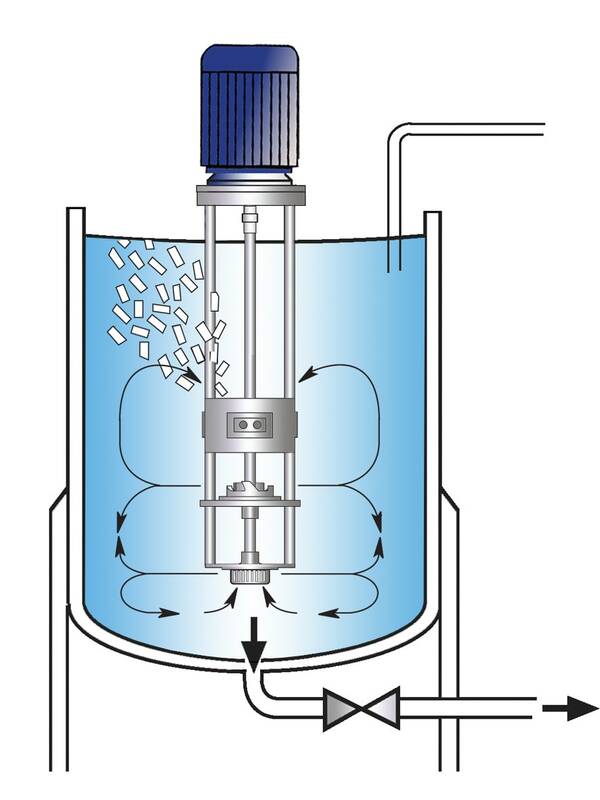 The lower workhead then draws the liquid and solids upwards from the base of the vessel and further reduces the particle size, accelerating the solubilisation process and ensuring a homogeneous end product is obtained.